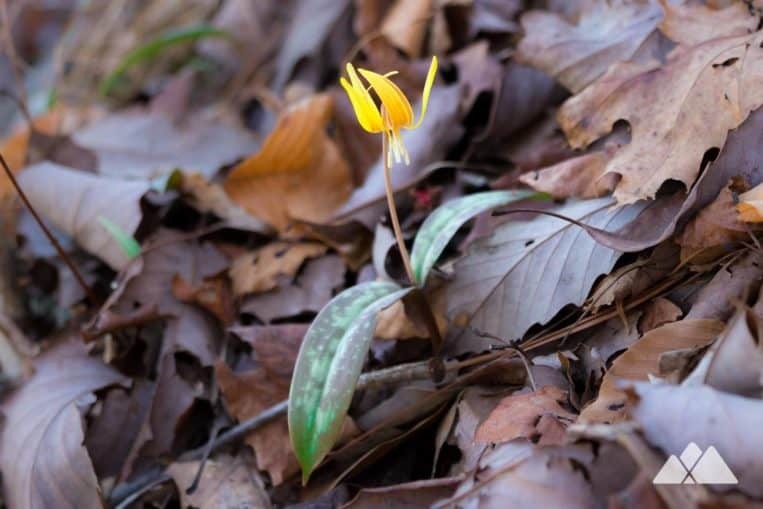 The Yellow Trail explores the eastern and western creek shores in the beautiful – and popular – Sweetwater Creek State Park near Atlanta. This hike crosses the park’s namesake creek over a large, steel span bridge to a yellow-blazed loop on the creek’s eastern shore, and visits a cave-like rock outcrop and viewing the park’s Civil War-era mill ruins across Sweetwater’s whitewater-filled shoals. The trail is moderately challenging, with one major hill to conquer, and makes an equally great day hike or beginner-friendly trail run. It’s ultra scenic, catching view after view of the wide-flowing creek from its relatively level banks. And while it’s a fantastic hike in any season, it’s particularly beautiful in springtime, when the surrounding forest explodes into bloom. The trail departs the park’s visitors center trailhead (view maps and driving directions), following the red-blazed trail and descending through a young, fern-filled forest. 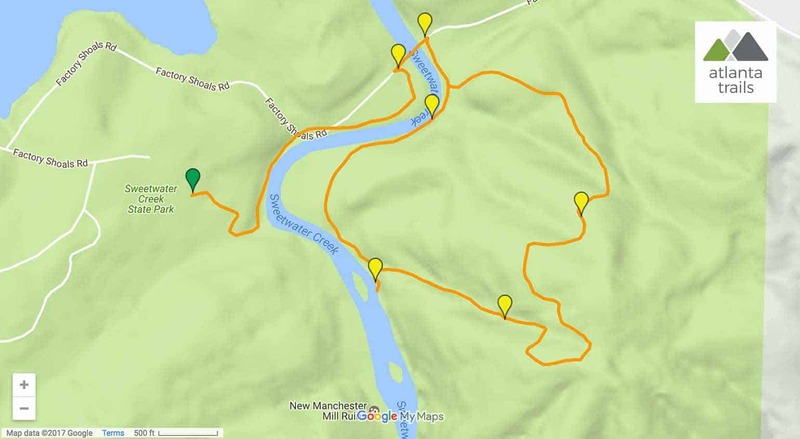 The hike reaches a junction at .18 mile on the banks of the wide-flowing creek, turning left to follow yellow trail blazes north and following the creek upstream. 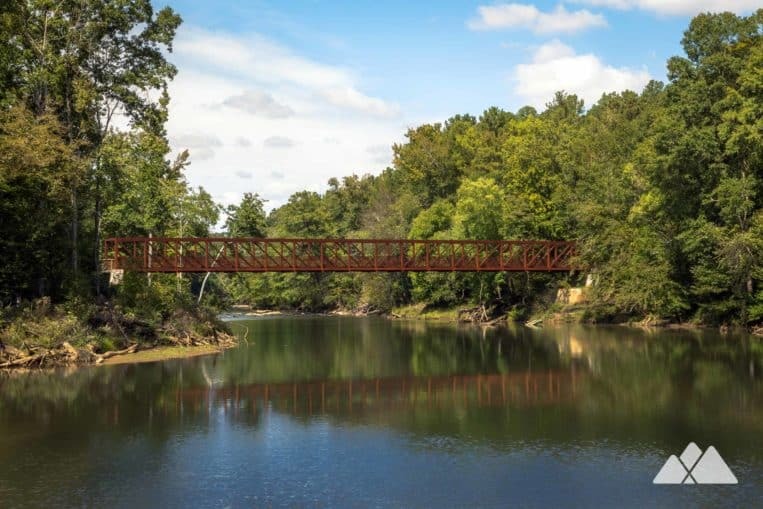 The trail reaches a large, steel and wood span bridge at .65 mile, crossing the bridge and catching views of the creek’s whitewater shoals from the crest of the bridge. The bridge’s rust-colored finish contrasts brilliantly with the creek’s blue hues and the surrounding forest’s vibrant greens. The trail reaches the creek’s opposite shore, turning sharply left to hike southeast into the forest and following yellow blazes downstream. 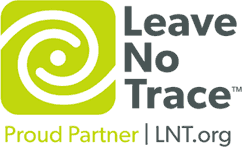 The trail reaches a junction at .8 mile, turning left to follow the yellow loop east in a clockwise direction. 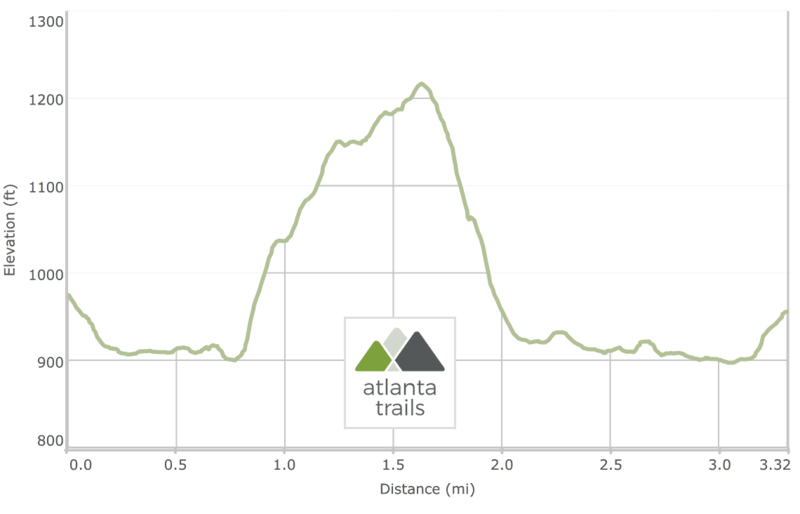 The trail rises steeply into the young forest, gaining over 300 feet elevation in .8 mile (a relatively challenging climb for a metro-area Atlanta trail). The Yellow Trail follows a small stream on the left as it descends, passing a small cave off-trail on the trail’s left at 1.8 miles. The hike continues to drop elevation, crossing the stream before returning to the creek’s banks at 2.05 miles. A side trail departs to the left, trekking several hundred feet to view the red brick New Manchester Mill, now in ruins after its destruction in the Civil War, on the creek’s opposite bank. The hike turns northbound, following the creek’s flow upstream on the yellow-blazed, wide-cut trail. Wildflowers and flowering trees flourish here on the creek’s sunny banks during warm months. The Yellow Trail reaches the steel bridge again at 2.65 miles, crossing to retrace the outbound hike on Sweetwater’s western bank. The route turns right at the trail junction at 3.15 miles, following the red-blazed trail through switchbacks to return to the trailhead. The hike reaches the park’s visitors center at 3.4 miles, completing the adventure. 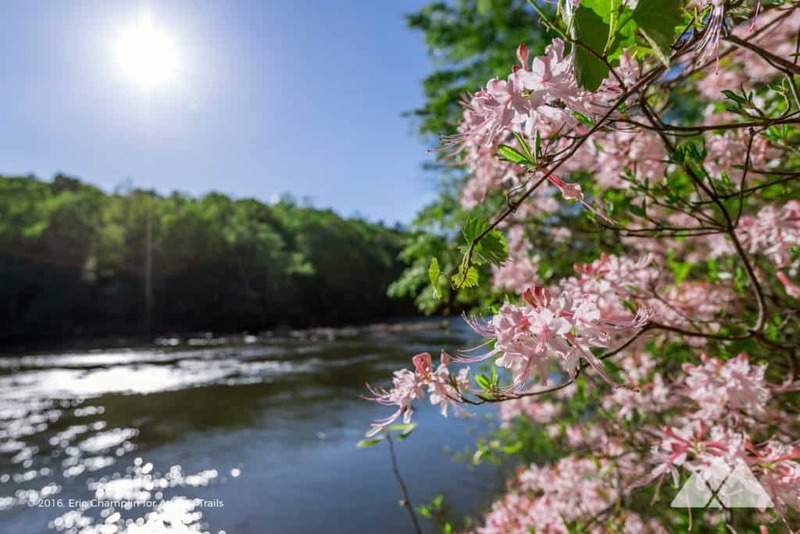 Atlanta’s favorite state park offers over seven miles of fantastic hiking trails along the banks of its rushing, whitewater-filled creek and the surrounding forest. Find more fantastic adventures at the park in our in-depth Sweetwater Creek State Park trail guide.